If you have more than one Yahoo! ID and want to use all of them in Yahoo messenger at the same time. Yes you heard it right all at the same time, yes now you can open two or more yahoo messengers in the same time on your Windows PC. Normally when you are using yahoo messenger to chat with your friend at that time you can use only one Yahoo ID and can’t open the new messenger with another Yahoo ID. Now you can run Multiple Yahoo messenger accounts at the same time with the helps of YM Multi Login Maker application. So with this way you can open several windows of yahoo messenger on your PC and login with a different account on each one of them. If you are regular yahoo messenger user, then you are aware with this fact that if you are running one yahoo messenger account on your Windows and clicking on the Yahoo messenger icon again does nothing. After installing YM Multi Login Maker on your windows PC, you can open multiple Yahoo messenger windows at the same time and login all of them with different users IDs. One of the best thing of the application is that. you don’t have to install the application on your windows. It is a portable application just run it once and you are done. This application is really useful to those users who are using two or more different yahoo messenger account for their word and personal use. Now they can use all of them at the same time, without signing out the another ID. 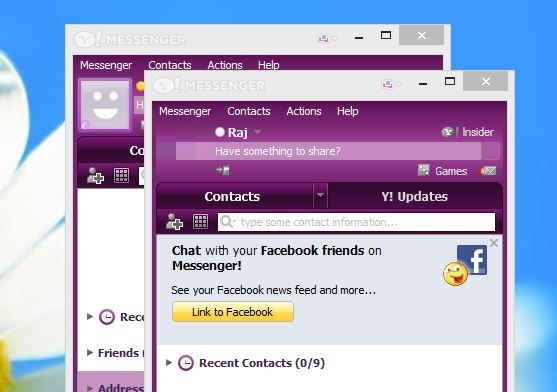 Now double click on your Yahoo messenger icon to open, You can open as many windows you want and login all of them at the same time. Now no need to sing in and sign out again and again to check different account on yahoo messenger. We tested this application on our Windows 8 pc and it works like a charm. If in future you don’t want to use this Multi login feature on your Windows, just run the application again and hit the Disable Multi login button to disable this feature on your Yahoo messenger. This simple user friendly software is a nice utility to open multiple yahoo messenger account on the same PC. One of the best and really useful utility for all those who have more than one Yahoo account.